I learned something new about children in poverty today. Surely, I already knew it—but it caught my attention in a vivid way this afternoon. A sponsored child at the Sovereign School in Cap Hatien, Haiti gave me a note. She had been a delightful girl and very helpful in things that I was doing there. She even tried to teach me Creole. But when I got the note, there was an “Uh Oh!” that went off in my mind. I just knew that she going to ask me to give her something. I figured she would hit me up for some money. Slowly I opened the little note looking for the request (they are usually for money or computers)—but this one was different. I think I need to repent. It said “I pray for you very much for God to bless you. God bless you.” That’s a pretty good message to get. It’s even greater from someone who speaks very little English. Then she did something else rather unexpected. She gave me a book. She said that it was her only book that she owned. And she said that she wanted to give it to me because if she did maybe I would remember her. 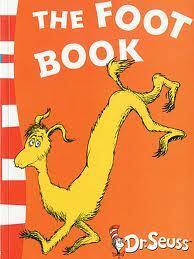 The book was The Foot Book by Dr. Seuss. Certainly it was an elementary book for her and for me. But it was all she had to give. It was subtitled “Dr. Seuss’s Wacky Book of Opposites.” As I thought about it, there was hardly anyone more opposite from me than this young girl in the slum of Haiti. So I took her book. It would have been easy to tell her to keep it since she only had one book. But I wanted her to know that her gift had value. I wanted her to know that she had dignity. I thought about her need. She needed an education. She needed food. She needed a break to escape her poverty. But in her eyes, she most of all needed to be remembered. She just wanted to know that someone somewhere was thinking of her. She wanted to know that someone remembered her. It was a hope that a long time after we had left that her memory would still exist. It was more than that. She hoped that someone would remember that she existed. Perhaps she tried too hard. But then again I have never been in her shoes. No, I am from the wacky book of opposites. I have seen pictures by the beds of sponsored orphans. They are pictures of their sponsors. I have thought in the past that they put them there so they could see the faces of the people who sent money to help them live a better life. But it is so much deeper than that. The picture is there to know that there is someone out there who remembers them. There is someone out there who knows they exist. So I will put my Dr. Seuss volume in a place where I can easily see it. And I will remember you, Jennielove. Milton Jones is the President of Christian Relief Fund in Amarillo, Texas. In his work there, he has focused on the care of AIDS orphans in Sub-Sahara Africa. He has also served as a preacher and campus minister in both Texas and Washington. Milton has authored eight books including a touching tale of one of his heroes with Cerebral Palsy, Sundays With Scottie. He is married to Barbie Jones and has two sons, Patrick and Jeremy. Thank you Milt, for this story. I really touched me. It’s heartbreaking but yet hopeful. I know that this one will stay with me and will be one of those stories that will come to me at the oddest times to fill my head with questions about the little girl–how is she doing, has she been successful, has she been safe from her environment? Just by telling her story you have ensured that she will be remembered by many people in this world, folks who will pray for her, even though they have never met her. For me it was a very powerful story and one that brought home the truth that we need to support a child and give them a chance to fulfill dreams and goals. We miss you Milt. Thank you. “We need a witness to our lives. There’s a billion people on the planet, what does any one life really mean? But in a marriage, you’re promising to care about everything. The good things, the bad things, the terrible things, the mundane things, all of it, all of the time, every day. You’re saying ‘Your life will not go unnoticed because I will notice it. Your life will not go unwitnessed because I will be your witness’.”– Shall We Dance? I like this movie line. It goes along with your wonderful story. A New Holiday Is Going Down the Drain!